During the construction of a new shopping mall in Dammam, it was decided that part of the structure originally destined to become a parking area, would be converted into a hypermarket. The change in use meant that the ground raft would need to accommodate the additional live loads which would be imposed on the slabs above. Because construction of the mall was already well underway, it was essential that any modifications would not interfere with the ongoing construction schedule. CCL’s solution involved the application of CFRP to the raft to provide the required level of strengthening. An additional protective layer was applied to the CFRP to protect against heat which would be generated when new asphalt was laid on top of the CFRP. 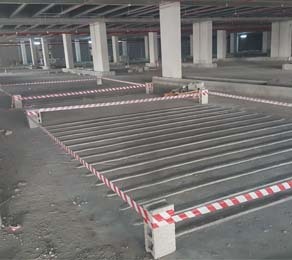 CCL issued shop drawings, submitted a method statement, supplied all material and equipment and completed the application of the strengthening works. The company also performed pull of tests on the completed CFRP works to ensure it had bonded properly. A 10-year warranty certificate was given to the client on completion of the work.